1.1. Bad WordPress Search Engine? I guess the best argument why you need a Google Custom Search is that WordPress has a really bad search engine integrated into it. And as a programmer I know why: the fact is that it’s really challenging to code a search engine. For me it’s crystal clear that no one at WordPress or from the community wants to improve it because it will never be good enough. Google is out there since 1998. This are more than fifteen years where Googlers working on the engine improving it over and over again. Just think of the manpower they put into the development of the search engine. It’s just unbelievable. The search gets slower the more posts you have. The more words you add the complexer the query goes (and the slower the query will be in the end). There is no “relevance rank” which means that the search results will be weird. 2 Home sweet home My car is really great! 1 My car This is a blog post about my car. What do you think will be on top of the search results? Yes, it’s the post with the ID 2. It doesn’t make sense to you? You’re right. As a human you would love to see the post with the title “My car” on top of the search results because it has more relevance than the post with ID 1. But a machine doesn’t really understand that. Of course there are a lot of possibilities out there to improve MySQL as well as it’s search behaviour (just think of fulltext search). I don’t want to go in detail because this is very technical and I know that you’re now saying: “Stop that! I just want good search results”:-) The only thing I wanted to say is: of course it’s possible to do a full text search. But you know what? It will never be as good as Googles. And it requires a full bunch of tech-knowledge to achieve that. The matter of fact is: we need an easier solution for this. The third thing is, that – of course – you do not really know what users have searched. With a Google Custom Search engine WordPress plugin it’s possible to link it with your Google Analytics account. That gives you total control over the search terms. Especially if you have a lot of content on your site and the users are using your search form heavily. First, you need a Google account. If you don’t have one click here to do so. Note: Do not forget the asterisk at the end! Otherwise the custom search engine will only search the homepage of your domain. The click the big fat “CREATE” button. After that three different buttons will appear. Click on the button which says “Control Panel”. On-Demand-Indexing and On-Demand-Removal are quite some awesome functionalities while using the Google Custom Search together with WordPress. Normally when you publish a post you have to wait till Google is crawling your website again to find the new page. This lead to problems especially if you’re using your WordPress blog as a shop. Consider you’re running a shopping plugin like WooCommerce on your blog. You’ve also integrated the Google Custom Search code into your theme or via a plugin (maybe you’ve used my Google Custom Search WordPress Plugin). Ok. You’ve planned to launch a new product today (maybe a new Camera) and therefore published this product via WooCommerce. Cool. But if a user is now searching for your product the Custom Search cannot find anything. Why? When a user is searching for a post that was published already but not indexed by the crawler he/she will not find the page. This is because it depends on the crawler. When it stops by and find your page it gets indexed. Luckily this will be during the next view minutes when you’ve published the new post. But in 99% it’s not the case. Normally a crawler stops by every 3 to 14 days (depending on how frequently you publish new posts). You see that by using this technology the crawler can index your new page much quicker than before. By manually submit the new URL (you can read how it works below). I think that this is not the best idea because you always have to log-into the the Custom Search Admin panel to submit it. You need some skills in coding plugins for WordPress as well as general PHP skills. Or by just using my Google Custom Search WordPress Plugin. Enter the URLs to be indexed in the field where it says “Specific URLs”, one per line. Please note that URLs must be from sites you have verified in Webmaster Tools. 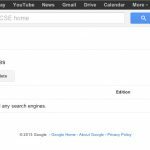 To request a removal of an URL from your search engine you have to prefix the URL with a “–“. Of course, this is the easiest way for all of us. Using a plugin that was well written and does everything for you is not only easy it also saves you both, a hell of a lot money and time as well. It sends On-Demand-Index and -Removal Requests if you want. In the free version of Google’s Custom Search Engine you have a quota of 200 pages for on-demand-index and 50 for on-demand-removal. If the quota is depleted it’s possible to continue to send requests but you will get an error saying that you’re over quota. If you need more quota, you can inform yourself on the Indexing quota help page about the costs. Note that it’s not really clear when the quota is set back. I was in contact with a Google employee but he couldn’t answer my question (!) accordingly. He just said that they will set back the quota “from time to time” automatically. Whatever that means. My experience is that it’s not a monthly-thing. The quotas of some of my customers were set back between one and two months. Of course, this depends on what you want to achieve and how it should look like on your own website. So in this section I just want to talk about general things that are possible with Google’s Custom Search Engine. On the Basics tab you give your search engine a name, a description and some keywords. 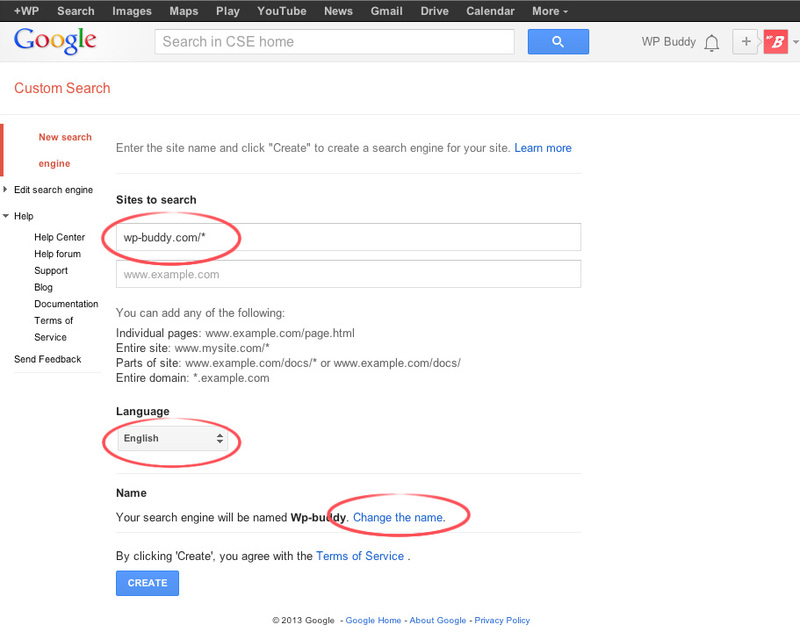 You can upgrade to the business version (which is then called “Google Sitesearch” instead of “Google Custom Search”). It’s possible to activate the image search (please note that there are some limitations when using the free version). you can set some labels for a better refinement of the search (I will write more about that later). On the “Make money” tab you can connect your AdSense account with the search engine to make money with the ads that are displayed. On the “Admin” tab it’s possible to add new users who will get access to the search engine settings. The “Index” tab was already mentioned in the On-Demand-Index and -Removal section above. Please see this section if you need more information. This tab also shows you the current status of your Indexing and Removal quota. On the “Advanced” tab you can upload a setting-file (called “context file”) which specifies a complete search engine – everything from “look and feel” up to “how annotations should be used”. Click the “Search Engine ID” button to see the ID in a small window. The naming convention of this is a little bit confusing. The first part of the above mentioned code (before the colon) is your Google User ID, the second part (after the colon) is the engine ID. Altogether it’s called “Search Engine ID”. Click the “Public URL” button to see the public URL of your search engine. You can also access your search engine via this URL if necessary. On the “Layout” tab can choose between different styles. Possibilities are “Overlay”, “Two page”, “Full width”, “Two column”, “Compact”, “Results only” or “Google hosted”. On the “Themes” tab you can set up the colours that are used to show the search results. It’s also possible to customize even more on the “Customize” tab. For example the font, the search box and the button. On the “Thumbnails” button you can activate if the search results should show thumbnails or not. You should always keep activated this because it delivers more information to your customer. On the “Promotions” tab it’s possible to add your own ads in your Custom Search engine. This helps if you want to promote a new product always when a user searches and even when it’s not included in the current search. I think this is a nice feature. Learn more about Promotions in Google’s Custom Search on this help page. The “Refinements” tab is used to add new Labels that get shown on your search results page. You can use the refinements (labels) on the “Setup” -> “Basics” tab. Scroll down to the “Sites to search” section and add a new filter. A new window will appear on where you can choose the label you’ve created on the “Refinements” tab. I think the tab “Autocomplete” is self explanatory. You can also add your own Custom Autocompletions if you think it will not work as you would expect it. The tab “Synonyms” is avery powerful functionality, too. Here it’s possible to add synonyms for particular expressions a user might use. For example you can define the word “auto” as a synonym for “car”. If a user types in “auto” your Custom Search engine will also find results with the word “car” in it. The “Advanced” tab on the “Search features” settings page is also very interesting. Here you can choose if the search results should be sorted (maybe by date, relevance or whatever you want). It’s also possible to change the settings for the Websearch and Image search functionality. On the “Stats” screen you can see some statistics. But it’s better to use Google Analytics instead as it provides more data. As I mentioned earlier in this post you can link your Custom Search with Google Analytics by just selecting a profile on the “Google Analytics” tab. The “Audit log” tab shows the latest activities from the users who have access to manage your custom search. The “Business” section is quite clear. There is only one setting to change. And that is if you want to show ads in search results or not. If you choose “no” you have to pay for the Custom Search Engine (which is then called Sitesearch instead). The only exception is if you are using the Custom Search engine as a charitable organization. If so the Sitesearch engine is free for you. Or just use a plugin that does everything for you. You cannot use the included search-form from your theme or the widget. Because using it will redirect a user to the themes search.php template rather than the page where you’ve added the code I’ve mentioned above. You have to be familiar with HTML, CSS and PHP. If you’re not familiar with at least one of these languages it can be difficult to get this to work. The next thing is that if you hardcode the searchcode into a template file it might get overwritten when an update is available. Of course, this is the best solution. 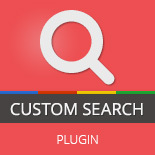 If you’re interested in such a plugin, please check out my Google Custom Search WordPress Plugin. It uses WordPress hooks to replace the WordPress custom search form. It adds a search page automatically to your list of pages without the need to add any custom codes. It also allows you to replace your themes built-in search form so that it looks good even after you’ve activated the plugin (see video below). There is already a detailed page that describes how to configure the Custom Search WordPress Plugin. So if you’re interested in how this works, please check out this page. 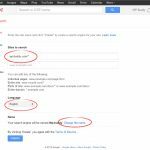 But I hope that this gave you a little insight on how powerful Google’s Custom Search can be for WordPress. It’s a complex topic but I know it’s worth the effort. Even when you have a great plugin like the Custom Search WordPress Plugin that helps you setting everything up step-by-step. If you have any question, please don’t hesitate to contact me via email or by just writing a comment below.